I think one would be hard-pressed to find a seasoned wet shaver who doesn’t have at least one of these products in their den. I’m talking about Catie’s Bubbles. The amazing success story that has not stopped since they started years ago. Hailing out of Forked River N.J. Chris took a hobby and made into something that even Forbes took notices of. I’ve always enjoyed the scents that Chris comes up with but I have noticed over the years that one particular scent seems to shine over most of the others and that one would be Le Piment de la Vie or “The Spice of Life” which is what this review will be based on. The packaging has gone through changes as many companies often do as the awareness to the public grows. I happen to have the old version of the label and tub so talking about them would not reflect what you would be purchasing today but I will say the change is always welcome. The scent of this soap is something you must experience. Chris does not give away the true complete profile in his description but he does say the heart of the fragrance contains Clove, Cinnamon, Nutmeg, and Ginger. There is absolutely more going on here than just these 4 notes. This complex scent is sweet, spicy, earthy and all around fantastic. I would go as far to say this could have been released as a cologne from any major fragrance designer and it would have been received as a hit. The performance is another shining star which of course does not change from soap to soap since the base formula usually stays the same. Granted my tub is a few years old and over the years you can expect feedback of customers which might lead to the tweaking of the formula but in my case, I have a little drying out of the soap all due to not being used on a daily rotation. I’m always testing and reviewing products which give me no time to revisit them more than once. The lather on this was just as good as the first time I used it. I created a real creamy rich lather that got right into the beard. 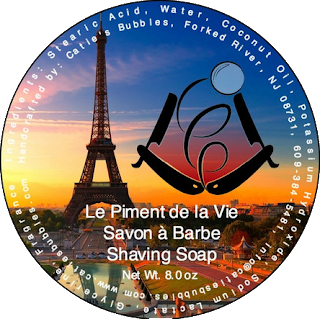 As for the slickness and glide note were perfect allowing me to go over sections of my beard many times without irritation of any kind. My post shave feel was again fantastic. So, I had a great shave with Le Piment de la Vie and to be honest I own over 7 tubs of Catie's Bubbles shaving soap all very different from the next. Each one allowing me the same level of a shave as I received from this one. the consistency of this product is what I like about it you always can expect a great shave no matter what scent you select.